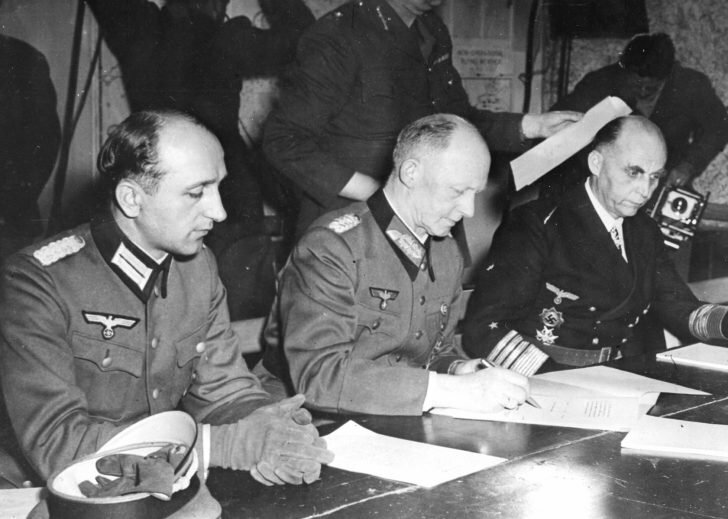 Colonel-General Alfred Jodl (center) signs the German surrender at the headquarters of the Allied forces in Reims at 02.41 local time on May 7, 1945. The leadership of the Soviet Union was dissatisfied with the signing of Germany’s capitulation at Reims, which was not coordinated with the USSR and which relegated the country that had made the greatest contribution to the defeat of the Third Reich, to the background. At the suggestion of the Soviet government and Joseph Stalin personally, with the allies, they agreed to consider the procedure in Reims a preliminary capitulation. The Allies also agreed that the case should not be postponed, and they appointed the signing of the German Surrender Act in Berlin on May 8, 1945.